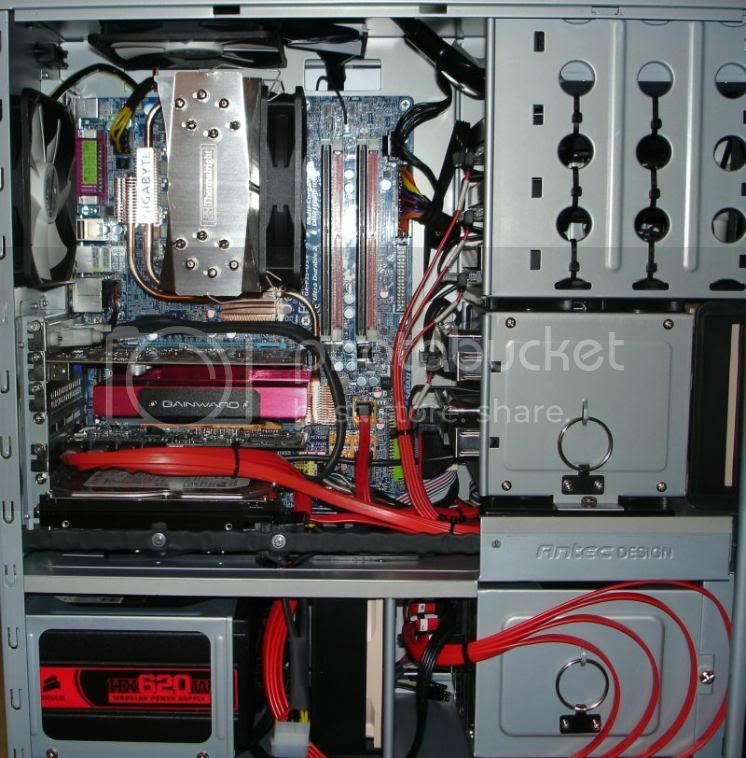 Ran Prime95 with 4 cores for 50 minutes, stock clocking, temps are 46 - 43 - 43 - 43 CÂº. Every core fluctates 1-2 degrees. Amazing... Couple of questions. 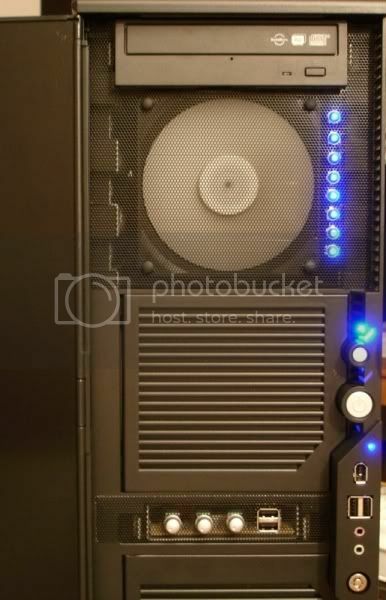 Is that with fans on 12V max? How is the noise level? Blend test in Prime95 or CPU stress test? I do not rememer the fanspeed, I will do a new test. But I guess more important than the fanspeed is the ambient temperature. Here is some unexpected, even for me; it's a new version! V. 4.0. I had this not planned, but I realized that it could be very usefull to have a separate harddrive for all downloads and temporary system files. As I said, it's for intensive disk operations and systemfiles. Anyway, all downloads, paging file, internet temp and system tempfiles are now on the new harddrive. how is the last hdd mounted? it doesn't look like it's soft mounted like the rest of them, is it? I realized that I did not post the latest pictures of v. 4.5. 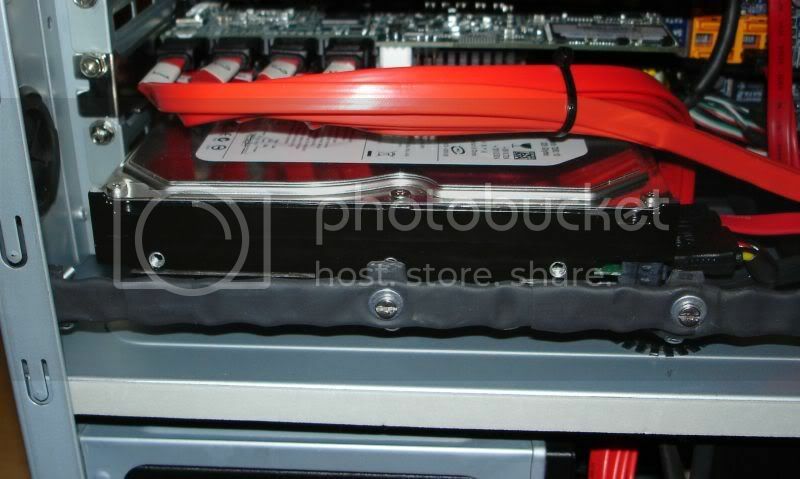 The latest changes some months ago was to softmount to 10th Hdd and replace the 2 remaining Antec fans with Nexus. Had to redo some soldering for the fan controller. I really like the Nexus, not so fan of Noctua.. Should replace them, but will not. Did a new temp-test today. After 70 min 100% load Prime95, sfft: 49 - 45 - 46 - 46. Wow, this is the first build I have ever seen where the P182 actually makes sense. P182 with one harddrive? Just get the Sonata or like i did, the even cheaper NSK4000. a fileserver with 10 hds, and without ecc ram. you are crazy. go buy a x38-ds4 and ecc ram. now. I would have called him crazy for running a file server with Windows and then complaining about file system fragmentation (switch to linux, run windows in VM if you must). Windows does a fine job as a file server, and file fragmentation isn't as much of a problem as you seem to make it out to be. Ext3 performs worse than NTFS does with filled hard drives, so simply switching to Linux is not always a viable solution. There is no such thing as a fragmentation-free file system, and linux system performance will degrade over time if file fragmentation is kept in check. Reiser and XFS have their advantages, but they're not perfect by any means. There are times when Linux has it's advantages (NFS is very clean compared to mapped network shares under Windows), but I'll still be running Server 2003 on my file server at home for a while. My simple solution to fragmentation - run a weekly scheduled defrag using PerfectDisk. Problem solved. Windows Server 2008 is excellent for file servers. Very modular, and it has SMB 2.0 which gives a big performance boost over using XP or 2000. Nick is right, fragmentation is generally not a problem with NTFS. It's much easier to configure SMB shares on Windows than on Linux with Samba too. Permissions are easier to set up as well. looking to do the same although not as busy as yours. my question is about your case fans, i want to get the quietest yet most effective fans, and i have seen the noctua's that you have and the nexus, but how are you finding them, are they producing enough airflow? and what are the noise levels like for each one? 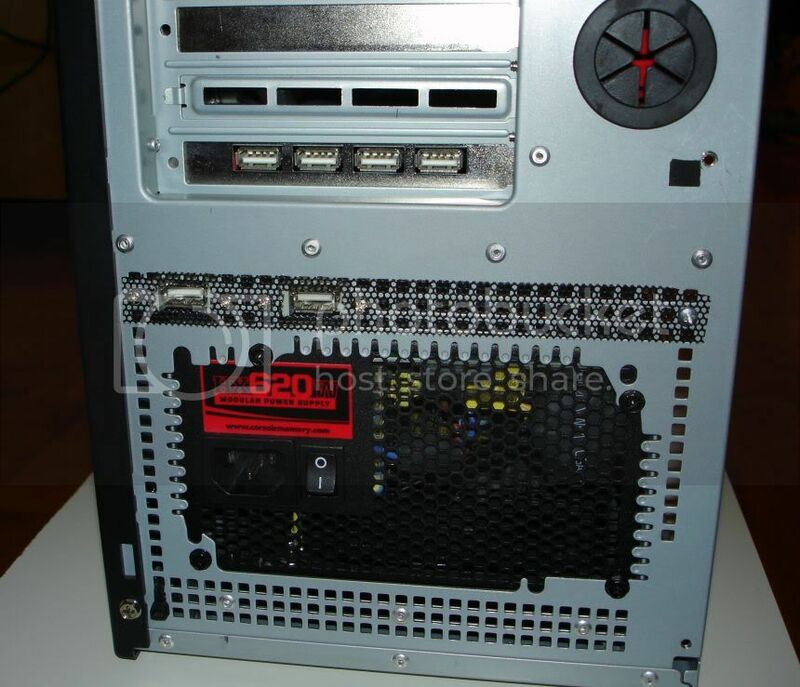 iv got a 8600 vga, so i think i will need to replace the cooler on that aswell. To be honest, I'd rather put the noctua fans as exhaust fans rather than intake, otherwise I have no comments about the fans. Do you have any temperature monitoring on the drives, Panter? Long time no see, so I better give you an update! Last autumn, late November, after the pc had been in work for 2 years I felt it was time for some serious renewing.. Clean some dust, cut some plastic, bend some metal, cut and solder some wires, replace some parts and get more storage. Started the transformation with buying 4 * Samsung F2 Ecogreen 1.5 TB Hdds to replace the 500GBs in the Raid6. But after reading that several people had problems with this Hdd in Raid I decided to put them in the WHS and the 8 * 500GB RAID6 drives were unchanged, just reformated and repartitioned to GPT. Instead I bought 4 * Samsung F3 1 TB and put them in in RAID5. 1 * Kingston V-series 40GB SSD was purchased and the 400GB Samsung and the 320GB Seagate are removed. The Pata Benq dvd drive is replaced by a Sony Optiarc AD-7240S Sata drive. That brings the total number of storage drives to 14! 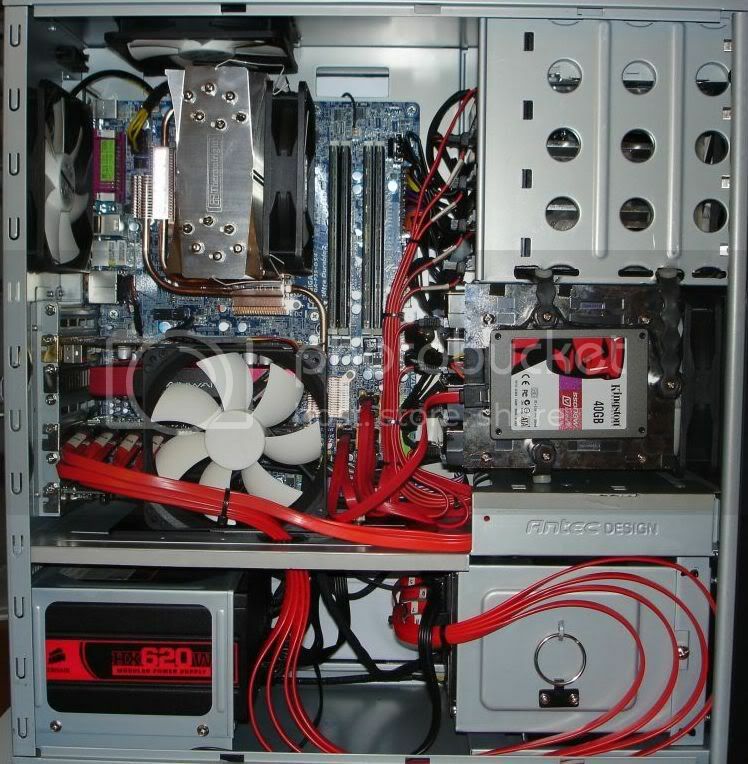 I spent a lot of time to get all the cables and drives in place, not to mention to have them nice and quiet. I have to say I'm very happy with the result. Installed another 2GB of RAM, the total is 6GB. The SSD is used for OS, Windows 7 64 bits. Replaced the 2 * Nochua fans with Nexus. Removed the metal in front of the 2 bottom front fans. The plastics in the fan doors were replaced with the same mesh as in the top. 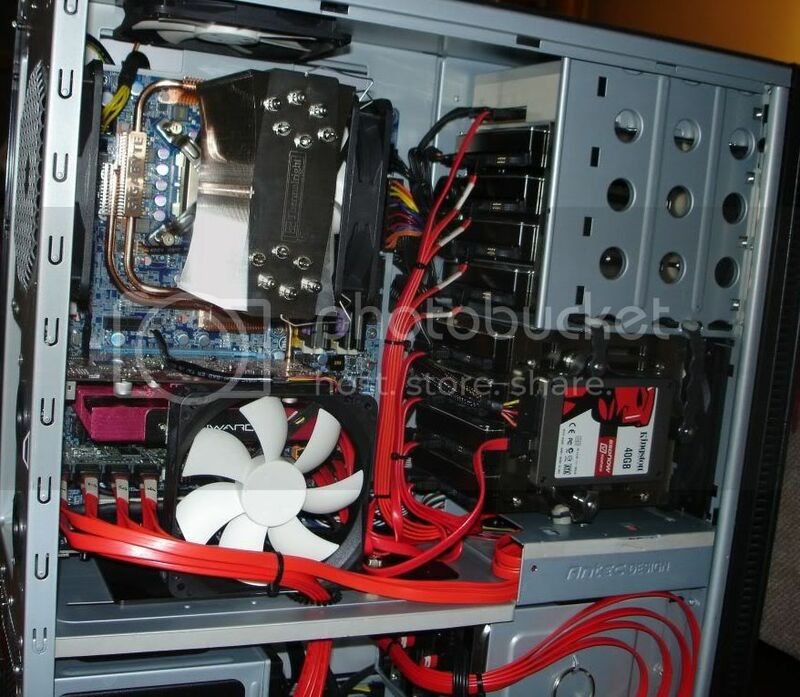 The bottom HDD cage and air intake was modified so the fan is now in front like the new P183. Took at lot of time to get nice. Removed the eSata adapter and cables as I had no use for them. Made space for eSata PCIe 1x if needed later. Installed a USB PCI card and moved the USB adapter connected to the MB to the lower chamber, just over the PSU. Last week I installed the modified Bios for the Kingston SSD to get Trim support so now its identical to Intel X25-V 40GB. While it seems complicated it's pretty straight forward and very easy! You get both Trim support and can use Intel SSD toolbox. Here's a photo I forgot I took just before V.5 was finished. I also forgot the Noctua fan.. Its not pretty and maybe not very usefull but it was something I put there temporarily to maybe cool down the Promise RAID card and the GPU. But it still there if I remember correct. Time will show. More pictures later, this is just a preview! WOW, that is alot of hard drives! replace all with SSD's and you got one SILENT machine! Nice build! I have a noctua and the colors grow on you Darn silent fan, sweet. This only adds up to 13 drives (if you do not include DVD, which is not a hard drive really). So is it 13 or 14 drives? Also, can you explain in a little bit more detail how you got 4 drives in the middle and 4 drives up top? I might have to do something similar in my Antec if I run out of HDD space. 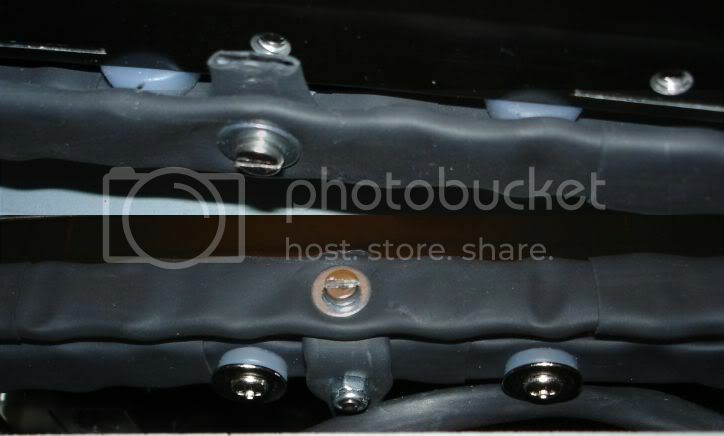 BTW, since I assume more than half of your hard drives are hard mounted now, how are the vibrations? 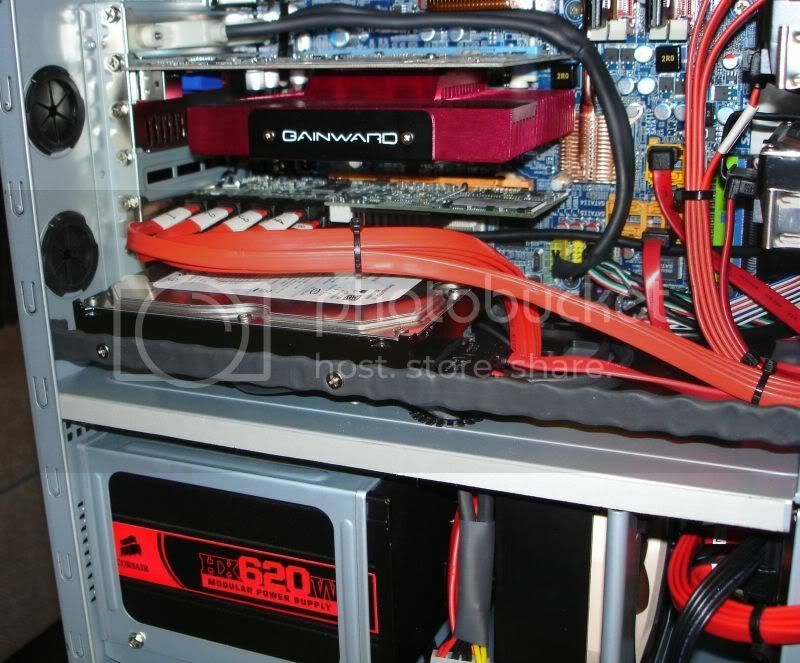 I had to replace the video card some weeks ago so I took some pictures as I promised 6 month ago.. There is still 14 storage drives, 1 SSD, 1 DVD and 12 HDDs. The top 8 Hdds are mounted in 2 * Scythe Hard Disk Stabilizer x4. I'm also using it in my WHS and like it. I find the vibrations to be very good. To be this crowded with Hdds and fans I think it's surprising quiet. 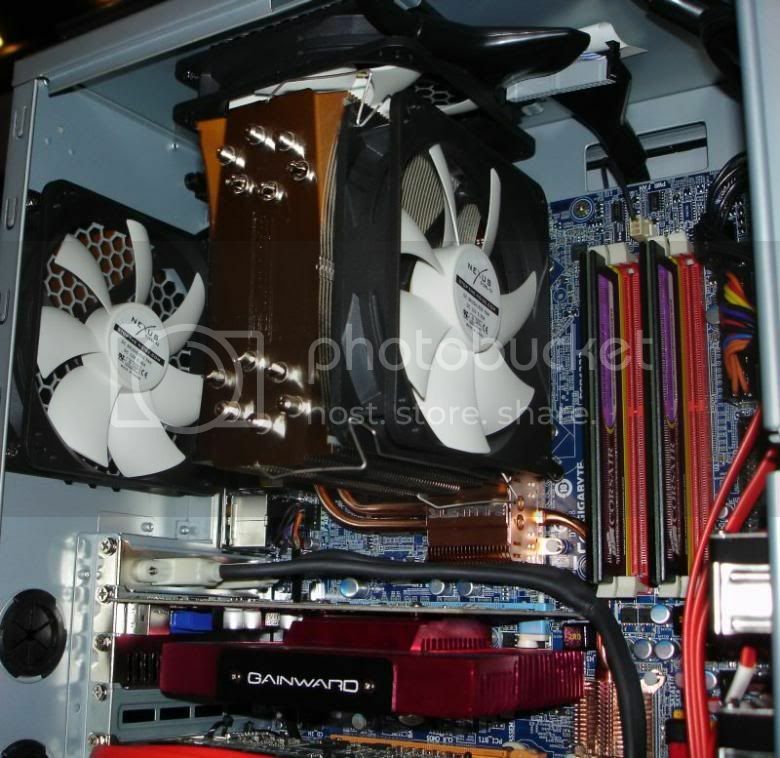 The 120mm Nexus fan inside is new to cool down the Promise Raid card and Gpu. Cool to see, because over the years, my system has become something similar to yours. But less neat, haha! 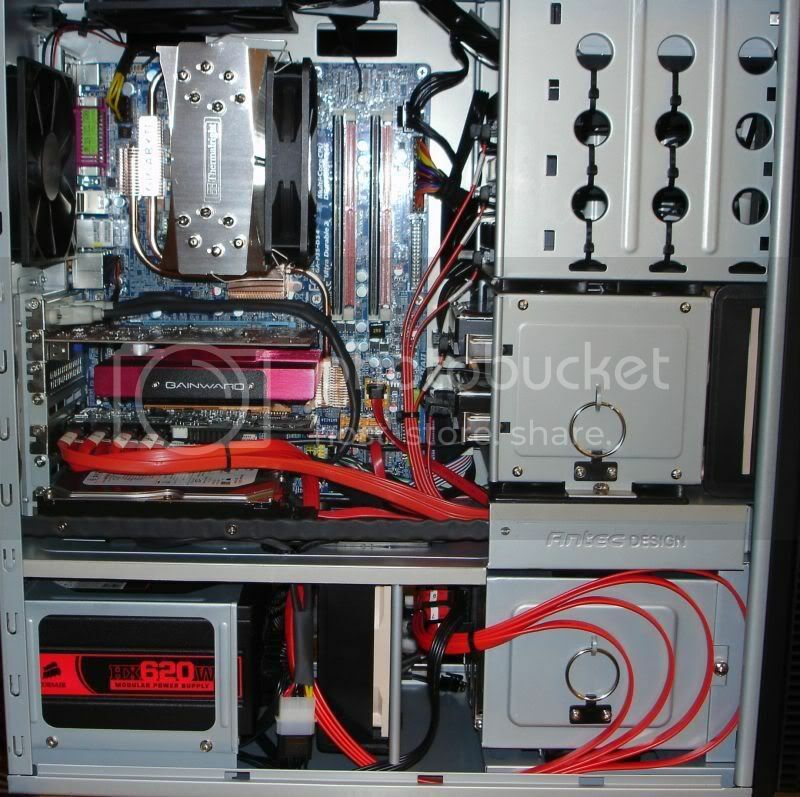 What's very similar is that it is a Core 2 system in an Antec P180 (vs P182), and 10 HDDs* + DVD . And Corsair HX620W! I also used a Scythe Hard Disk Stabilizer x4 in the top area. What is different is that my others components mostly seem bigger... Makes a proper organisation a bit more difficult. 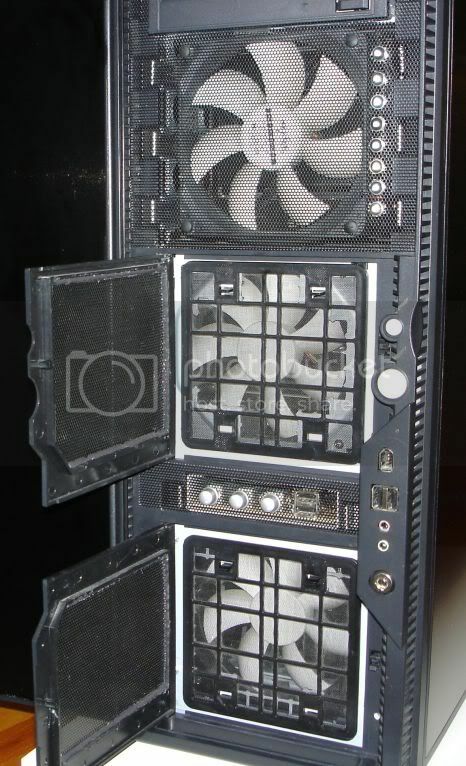 My graphics card is a Radeon 4870 (pretty long card, the PCI-E power connectors need to share space with the connectors for the middle HDDs) with the much-too-large Arctic Cooling Accelero heatsink (+12CM fan), my processor is cooled by a large Scythe Ninja (+12CM fan). And below that I have the RAID card and a Creative X-Fi soundcard. Also a 2x SATA3 card, but it is now unused because I bought the RAID card. 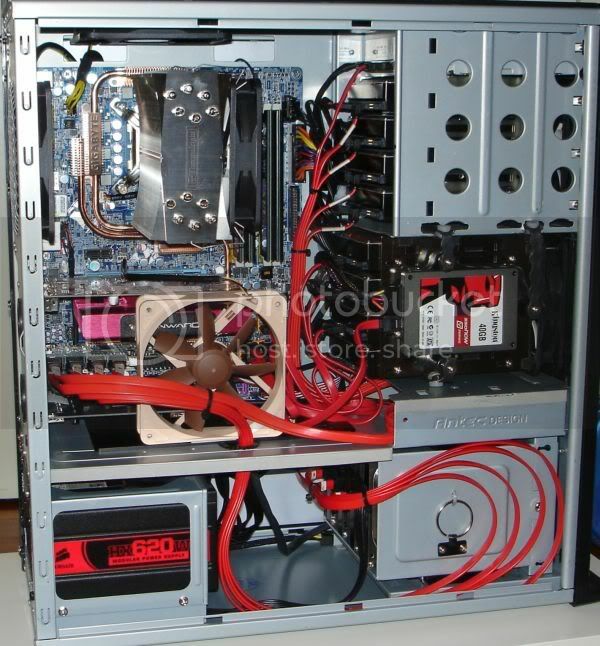 I used to do crazy things like use the eSata on the backplate of my motherboard and loop it back inside to connect an internal HDD, hehe. I had to remove my Zalman MFC1 fancontroller because I needed the DVD-bays for HDDs, so now I am using the floppy drive bay just like you. I have a Scythe Kaza Q8 there, which I really like, becayse it's black and can control 8 fans (I have 7 connected now), while it's only 3.5" . When I started with this sytem I already cut out most of the metal mesh of the 2 front ventilation/fan areas, and I usually leave out the dust filters. I did the mod with the little fan doors you see on the forums where you remove parts of the 'blinds' to improve airflow. I have put a 12CM fan in front of the top 4 bays, but it has been 'installed' there mostly with packaging material (hey, it isolates vibrations! ) and duct tape. Not neat, and no dust filtering... Trying to make my case not look like a total mess of cables was quite a challenge, because the P180 lacks some of the cable management the P182, mostly the behind-the-motherboard stuff. Plus I never used a soldering iron or any heatshrinking things. I have now hit the limit of how many drives I can fit in the case, so these days I was already looking at the middle part, to see how I could fit 4 HDDs in there instead of the normal 2. Could you provide more details about how you installed the Scythe Stabilizer there? I do not recognize the material you used there (that same stuff you used for the 10th drive in your v4.5), what is it? I will personally be a little bit demanding when I do it myself, because I want/need my case to be transportable without my drives jumping around my case. And if possible, it should not be a 1-hour job to remove 1 drive when I need to . Is there anything you would do differently if you would have to do it again? Or do you have any suggestions for me? For me it would be a good solution if I can install my Scythe Stabilizer in the middle, because then I can try to order a Lian Li EX-36A2 for the top. (Try, because it appears to be very hard to get, I have been waiting for a shop for more than a month now.) 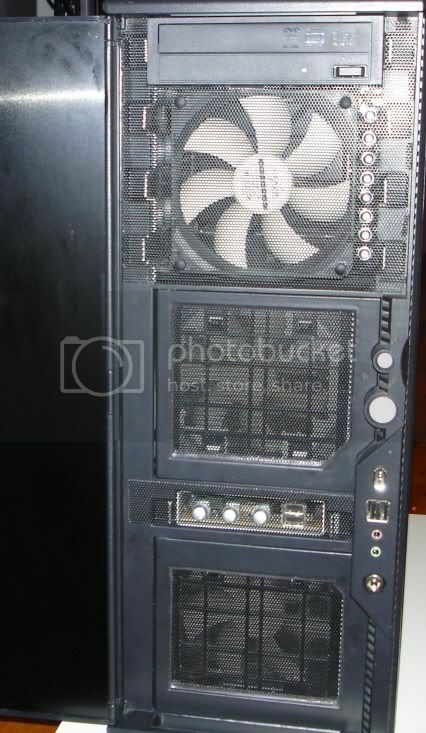 Then I would not have to bother about proper installation and cover for the top fan because the Lian Li already has it. And I will be able to fit 2 moreHDDs total than I can have now, plus two SSDs! The Corsair HX620W is still keeping up with it's job, keeping all of this running, after so many years! I am quite impressed . (But it does need to be opened some time, it has a bunch of large blobs of dust in there.) I did try to spread out my drives as much as I could, for example trying not to connect 4 drives to the same cable. 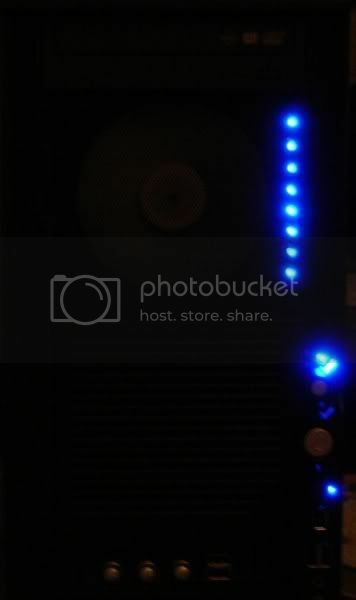 Did you connect 3, 4 or maybe more of your RAID drives to the same cable? I was thinking that because they are in RAID, they could all spin up or be very active at the same time, needing the most power all at the same time, I was not sure it was able to deal with that peak. Especially because they are 7200RPM drives, not 5200RPM or 5900RPM like most of my other drives. DVD Sony DRU-190A. It's a PATA drive. 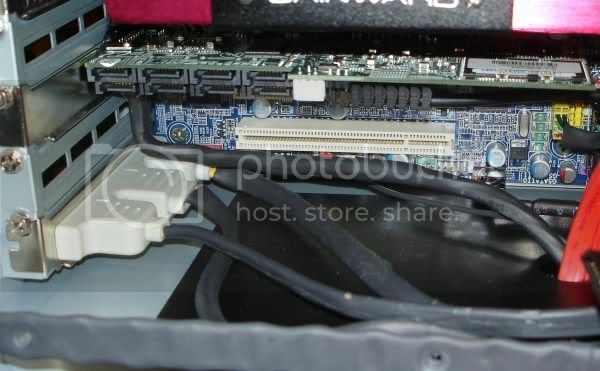 I actually had a SATA DVD drive, but I was running out of SATA connectors on my motherboard, so I traded it with someone for this one. I would be curious to hear from you . Our experiences seem quite similar even though they are pretty exceptional (stuffing so many drives in this case and still running Windows are both not very 'expected' I think, aka crazy ). Maybe we can learn from each other!